Future proofing social values in Housing Associations. He was once an immigrant. I just looked around and they were gone. The clock on the tower of the church in Evington Village struck a quarter to the hour as they exited the door. I spotted him immediately. His flowing white hair blowing in the cold biting wind. He marched in time with the others. His back ramrod straight despite his age and infirmity. He swung his cane with a swagger. A swagger he had carried throughout his life. He was on parade again. Medals proudly flashing on his chest in the low sunlight. He was marching with the local branch of the British Legion to the small cenotaph at the centre of the village. He did not know I was watching, hidden behind the church wall. He did not know I was filming his last parade. I wondered what thoughts were going through his mind as he marched with his comrades for the final time. I could see that his eyes were watering. Was it the wind? Was it his memories? He had been mobilised in the spring of 1939 as he was in the Territorial Army. When War was declared in September he was serving in the Royal Leicestershire Regiment. His army number was 4859243. He was transferred to the Royal Artillery in 1940. He spent most of the War serving on anti-aircraft batteries. He was injured in the leg and blinded in one eye while in action. He was the fittest in his platoon. He could run a mile in under 5 minutes on cinder tracks wearing old plimsolls. He became a physical training instructor. Because of this, he was promoted to bombardier on many occasions but his lifelong struggle with authority and regulations meant that he was ‘busted’ to private just as regularly. On his wedding photo you can see the shadow of his stripes on his battle dress. Like many of his generation he rarely talked about the War. All I have are brief glimpses of what he did and what it meant to him. He served most of the time in remote locations in the UK. But, he did tell of excursions abroad to bring back the diamonds from the Netherlands and something he called Heavy Water. He never claimed to be a hero but he was proud of his service. For him it had been an adventure in the same way as attending university was for many of my generation. He was away from home experiencing a different life and making new friends. Friends that he remembered for the rest of his life. Was he thinking of them now as he marched in silence to the beat of a lonely drum? I know he missed Mam during those long years. They were married in 1942 in her local church in Leicester. He was on special leave. My sister Pat was born the following year. He saw very little of her until he was demobbed in 1946. On one occasion he ‘borrowed’ the battalion motor bike and rode from the south coast in the middle of winter to see them. His hands were frozen to the handlebars when he arrived. He was punished on his return and lost his stripes again. He told another story of a time he was stationed in Belfast. He did not know the town. On a Saturday evening he walked into a local pub to ask the way to the nearest Catholic Church so that he could attend evening Mass. The pub was in a protestant area and was full of Orangemen. Even though he was wearing the uniform of a British soldier he needed all of his fighting and running skills to escape that night. He had lost his boxing medals during the blitz of Sefton when his billet was bombed out. The only medals that survived the war were the ones he was now wearing on his chest as he marched on into the cold headwind. I walked along with him, still filming. I could see that he was struggling but he would not stop. There would be no more parades after this. The local branch of the Legion was disbanding as most of its members had passed on. He had been determined to attend and to finish the parade, despite his illness. We had always argued about Remembrance Day as we argued about many things in my youth. I failed to understand what it meant to him. As a pacifist I thought he was glorifying war and cruelly told him so. I know now that he hated war as much as me and that the parade was a reminder of this and of the friends he had lost. He said goodbye to the few who remained and we walked to my car to drive home. We did not speak. We rarely did. His knuckles were white as he gripped his seat. He never trusted my driving. I never showed him the film I shot on that day. I keep it as a memory of his life and of his courage and of his suffering. When he died in 1997, Mam told me that he had asked that British Legion Colours be placed on his coffin with a guard of honour. I told the old Irish Monseigneur at their local church that this was his last wish. He refused to allow it. He said that there would be no representatives of the British Army in his church. He knew my Dad well. They had often argued about this and about many other things. They were both stubborn men. I told him that I supported a united Ireland and understood his concerns but that this was Dad’s wish. We compromised and the British Legion members walked after him with colours flying as he exited the church from the funeral mass. This was truly his last parade. I walked behind them in honour of dad’s final wish. Seeking his forgiveness for the arguments of my youth and the words that were never said. He was my hero in so many ways. Yet I never told him so. I say it to him now as I watch him march away again, his head held high, his back ramrod straight, his hair flaming in the light of the setting sun. Still talking after all these years. A talk I gave recently to North Wales RSL Equality Partnership. Nearly 40 years ago I was secretary to the social housing sector’s first enquiry into Race and Housing. It was established by the National Housing Federation in the wake of a period of social unrest which occurred in many inner cities in 1981. The enquiry produced its first report in 1982. It found that housing associations and local authority housing departments were guilty of racial discrimination both in the provision of their services and in their employment practices. The report made a number of recommendations to overcome this. 40 years later we are still talking about the issue in the context of a wider debate on diversity or lack of it in social housing. Has anything changed? Clearly there has been gradual progress in some areas but a number of recent reports show that we still have a long way to go. A report in Inside Housing revealed the extent of racism, sexism, harassment and bullying in UK Housing. I expected an outcry from the sector in response to this. But it did not come. The silence from our leaders was both shocking and shameful. It appears from the lack of comment and even more importantly the lack of action that the sector is in denial about the issue. Or does it think that it is immune? Evidence from elsewhere suggests that it is not. Reports into similar behaviour in Parliament show that sexism, harassment and bullying are endemic. A report into activities at Save the Children tell a similar story of sexual harassment, bullying and more. The report indicates that 30% of staff reported such behaviour which compares to similar figures in other sectors. If we accept the findings in Inside Housing, this figure is almost certain to be repeated in social housing. We are not immune. Another report showed that we are also continuing to fail in employment of senior staff. The number of women or BME executive and non-executive leaders in social housing is extremely low. In recent years the number of women leaders has increased gradually especially in Wales. The number of BME leaders has remained static or has even fallen. There was an expectation that this would change when the current generation of mainly white male leaders reached retirement age and moved on. Did it? Inside Housing looked at 34 appointments of chief executives of larger housing associations in the last 2 years. This showed that only 1 new BME leader had been appointed and only 5 women. A once in a generation opportunity to change the diversity at the top of social housing has been lost. Many reasons have been put forward to explain this shameful failure to recognise the diversity in our society. I continue to believe that, just as they did 40 years ago, racism and sexism play their part. Although the sector again fails to recognise this. It has become the issue in social housing that dare not speak its name. Some have called for an independent enquiry to be established to investigate fully these matters. I support this call but will our sector leaders? A recent article in 24Housing raised similar issues and rightly identified the role of housing association boards as crucial. For me this is where we start to change. Boards should set the culture of organisations especially on what behaviours are acceptable and what are not. They should insist that there is zero tolerance of racism, sexism, harassment and bullying. They should regularly ask awkward questions of senior staff and others on this. They should establish fully independent whistle blowing policies and safe areas and support for those who experience such behaviour. They should look at their own behaviour and prejudices and ensure that in their recruitment and appointments the board and senior teams reflect fully the diversity in society. All of this should be regularly monitored and reported openly at least once a year. A fully comprehensive equality and diversity report should be part of the annual report. I would go further and make it an independent regulatory issue. The reason is simple. The only time social housing made real progress on these issues was when it was part of the regulatory regime. We began talking about these issues over 40 years ago. We have talked for too long. What we need is real action and change. That process starts with you. A message from Richard Farnells’s family on arrangements for his Thanksgiving Service at Coventry Cathedral at 4pm on Subday 21st October. When we gather at the Cathedral on Sunday 21st October, at 4pm, as a family, we hope to be able to say ‘hello’ to as many of you as possible. Please introduce yourselves, and forgive us if we don’t recognise you or know your connection with Richard- he had numerous networks! There will be cards to complete to let us know that you were there and what your connection was with Richard. Do bring a pen to complete one to help us, thank you! Allow plenty of time to park and walk to the Cathedral. Most of the city centre car parks are reasonably close. Find yourself a loo before you get to the Cathedral- they are in short supply once there! If you are visiting from a distance, and have time, take the opportunity to explore Coventry City centre and visit the Cathedral beforehand. It is a very special place! The Cathedral’s ministry of reconciliation is so important in our world today. The University is right next to the Cathedral and is also an exciting institution these days! Richard’s academic work regularly straddled the City / University / Cathedral. We hope to have a loop of photos displayed at the back of the Cathedral before and after the service. There will be drinks available after the service. The actual service is planned to be about an hour long. If visiting clergy wish ‘to robe’, please contact the Precentor, Canon David Stone. My housing obituary for Richard Farnell based on my tribute to him which is also on WordPress. “Richard Farnell, who died on 23rd September 2018 probably did more for social housing over the last 30 years than anyone I know. Until recently he served as a non-executive and Chair on many boards with no reward except knowing that he was helping to provide one of our basic human needs, a decent home at a price that people could genuinely afford. He was one of the unsung heroes of social housing who are the real keepers of our social purpose and values. His passion for social housing was second to none. Richard was a man of many titles. He was a Canon Theologian of Coventry Cathedral. He was also Chair of the Cathedral Council. He was the Emeritus Professor of Neighborhood Regeneration at Coventry University, where he taught urban studies and town planning for many years. He has served on many national and local committees. He was also the ex-Chair of Touchstone and Keynote, the founding Chair of Midland Heart and the first Chair of The Extra Care Charitable Trust. During his stewardship at Touchstone Richard led one of the most innovatory housing associations in the UK. They pioneered ideas and projects that are still seen as ground breaking in social housing today. 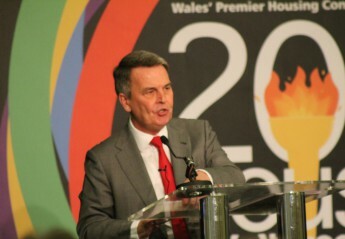 As Chair of Keynote he led what was to become one of the major inner city regeneration associations in the country. He led the merger of Keynote and Prime Focus to form Midland Heart, one of the largest and most successful housing and care organisations in the sector. All of these associations bore the imprint of his social values and purpose. He was by nature a quiet man, characterised by integrity and humility, qualities that are essential for true leadership. His passion for social justice was derived from his deep Christian faith. I wrote this for Richard so that he knew how much he meant to me and others. He died of on 23rd September, 2018. Words cannot express my sadness at his passing. I leave this here now as a tribute to his life and as a memory of our friendship. I have been reflecting recently that we often only tell people what we feel about them at their funeral in the form of an eulogy, when some would say it is too late. Surely it is better to say what we feel when they are still alive. For this reason I have decided to write a tribute to one of my closest friends while he can still read it. I was shocked and saddened to hear recently that oncologists have told him that he has only months to live. A melanoma that started on his heel some years ago has spread to most of his organs. He is now too weak to undergo treatment and he is receiving wonderful care and support from the NHS and his family and friends at home. His mind is as sharp as ever but his body is failing. He celebrated his 71st birthday on 31st August. His name is Richard Farnell. Most of you will not have heard of him. But he has probably done more for social housing over the last 30 years than anyone I know. Until recently he served as a non-executive and chair on many boards with no reward except knowing that he was helping to provide one of our basic human needs, a decent home at a price that people could genuinely afford. He is one of the unsung heroes of social housing who are the real keepers of our social purpose and values. His passion for social housing is second to none. He is a man of many titles. But you would not know it. We used to joke about them. He is a Canon Theologian of Coventry Cathedral. He was also Chair of the Cathedral Council. He is the Emeritus Professor of Neighborhood Regeneration at Coventry University, where he taught urban studies and town planning for many years. He has served on many national and local committees. I know him best as the ex-Chair of Touchstone, Keynote, Midland Heart and The Extra Care Charitable Trust. During his stewardship at Touchstone he led one of the most innovatory housing associations in the UK. They pioneered ideas and projects that are still seen as ground breaking in social housing today. As Chair of Keynote he led what was to become one of the major inner city regeneration associations in the country. He led the merger of Keynote and Prime Focus to form Midland Heart, one of the largest and most successful housing and care organisations in the country. All of these associations bore the imprint of his social values and purpose. He is by nature a quiet man, characterised by integrity and humility, qualities that are essential for true leadership. His passion for social justice is derived from his deep Christian faith. I was proud to work with him as Chief Executive of Keynote and as Chief Operating Officer and eventually Chief Executive of Midland Heart. I can honestly say he is the best Chair I have worked with in social housing and I have worked with some of the best. I learned so much from him and I am still learning to this day. He provided the support and direction that all leaders need to help them through the good times and the bad. I owe him so much. I hope that he knows how much he means to me and all those who have had the privilege of knowing him and working with him. Literally thousands of people are living better lives in the Midlands and elsewhere because of his work. I am also proud to call him a friend. Our friendship grew out of our working relationship and has blossomed in recent years. Since our mutual retirements we have met regularly to walk along the canal at Hatton, finishing with a pint of our favorite Purity Ale and a sandwich at the local pub. Those walks have been some of the happiest times I have spent in recent years. As we walked we talked. Or to be more correct I talked and Richard listened. He is a great listener which is why he is such a wonderful chair, leader and friend. When he spoke they were words of wisdom. Ten words from Richard were worth a thousand of mine. I shall miss our walks. I shall miss our talks. But most of all I shall miss a true friend. His words shaping my own thoughts and sometimes calming my anger and frustration at the growing levels of poverty and inequality in the UK and the demise of real social housing. After a rant from me he would smile and quietly respond. I always drove home from our walks feeling a better person. Richard has that effect upon people. He makes people feel better. He has a strong faith but does not impose it on others. He would often share his beliefs with me, gently nudging me to reconsider my own faith or lack of it. Like everything he did, he did it with the gentlest of touch. That is what makes him the person he is. A true gentleman in every sense of the word. I tire sometimes at the overuse of the word legend in our media and elsewhere. Richard would never contemplate the thought but to me he is a true legend. He has done so much to change my life and that of many others. If I have achieved anything in recent years, it is because I have been able to stand upon the shoulders of this giant of a man. A man devoted to his family his faith and his friends. If he passes he will be missed by all. Since my appearance on Dispatches I have been thinking about my future. Like many I was disappointed with the programme and I agreed to do a podcast for Inside Housing to set the record straight. I was not unduly concerned about the personal comments and criticisms from the housing sector. I have a thick skin and I expected some negative feedback. What worried me was the sector’s inability to address the issues mentioned in the programme. Yes it was unbalanced, but it raised important questions that echo those discussed in two recent commissions on the future of social housing. These show that HAs need to rebuild trust by working more closely with tenants, communities and other stakeholders, to overcome the perception that some have moved away from their social purpose. Something that even 60% of HA staff think is happening according to the Guardian . It is my view that if we continue to fail to debate these issues openly and with a wider public we will fail to resolve them. And those who do great work in our sector including many in Placeshapers and elsewhere will be seen as guilty by association. For some years I have been critical of the government’s housing policy and have challenged the sector’s response to it. I helped to establish SHOUT with Alison Inman and others because many in the sector were silent on these issues and on the demonisation of social housing and its tenants. I am pleased to see that many of the points we raised, to much criticism at the time, are now being championed by our leaders. Perhaps, if they had championed them 8 years ago we would be nearer to solving the housing crisis and to preventing the rise in homelessness, inequality and poverty. However it would be churlish of me not to welcome the epiphany that some have undergone. Just as I welcome that some HAs have written recently of the need to rebuild trust by reverting back to their social purpose. I hope that they turn their words into action. As some in the sector have begun to realise the need to change, I have been thinking where I concentrate my efforts in future. I have known throughout my career that there is always a time to move on from whatever you are doing. I have done this on a number of occasions. I am beginning to feel that it is now time to move on from being a “housing campaigner and commentator” before I overstay my welcome. If it is not already too late! I will start this process with the NHF National Conference. I have attended every Conference since my first in 1979. During the 1980s I helped arrange them when I worked for the NHF. This year would have been my 40th. The Conference was once the highlight of the social housing year where people came together to debate openly and sometimes fiercely the issues of the day. I always left feeling refreshed, full of ideas, with my sense of social purpose burning even more brightly. I no longer feel this. I have left recent Conferences feeling despondent and depressed. The Conference has become a shadow of its former self. The title has been changed to remove any reference to social housing which some thought “got in the way.” This is reflected in the agenda which is tightly controlled with little opportunity for real debate. In recent years I have attended a number of plenary sessions where no questions were taken from the floor. Nowhere was this more apparent than when the sector was asked to blindly support the extension of the right to buy to housing associations to appease a contrary government. This year the Conference has changed its name again to the National Housing Summit and has moved to London in order “to attract the best speakers.” I have decided not to follow it. I will declare at 39 not out. I suspect I will not be missed. I hope that some who attend will continue to challenge; to remind HAs of their reason for existence, of their social purpose, of the need to put tenants at the heart of their decision-making and much more. I am sad that I will miss meeting up with some good friends and colleagues. I am sad that I will miss the new NHF chief executive. I hope she follows the example of other women housing leaders at the CIH, Shelter and elsewhere. They have transformed their organisations to reconnect with their roots and to rediscover their campaigning zeal. If that happens I will be more than happy to observe from afar. It looks as though Dispatches and the podcast might be my swan song to the housing sector and to this period of my life. If I had a choice I would rather it be my Lifetime Achievement Award, or my speech at the TPAS Conference in July, or the one I will make to TPAS Cymru in November. I hope that these show that I always tried to speak “truth to power” to seek justice for those we were set up to help. This was my only motivation in all that I have said and done in recent years and before. I now have other things to do working with The Mayday Trust and North Wales Housing. Back to the frontline of social housing. Back to where it all began. Back to where my housing soul lies. As I begin to move on, I would like to thank those who have supported me over the last few years. You gave me comfort when times seemed bleak. You gave me strength when I was attacked for my views. You gave me joy to know I was not alone. I will leave you with a bit of Dylan, who I have often turned to at important times in my life. It sums up how I feel as I make this restless farewell. “I am fearful that we will repeat the failure of previous initiatives going back 40 years – unless we address the problem within.” I wrote this in an article for Inside Housing in January. The “problem within” I was referring to was racism and discrimination in housing. I was criticised at the time and told that I was upsetting sector leaders as the claim was untrue. Now, thanks to the excellent work of Jess McCabe and Inside Housing, we know that racism, sexism and discrimination does exist in housing with “problems reported across all forms of discrimination covered in the Equalities Act 2010”, and beyond. I am not surprised by the findings in the report. I have witnessed and dealt with numerous incidents in my career. Both as a chief executive and as a chair, I have disciplined and dismissed a number of senior managers for racist and sexist behaviour. I have campaigned against all forms of discrimination since the 1970s. In recent years, my claims that it still exists in the housing sector have been largely ignored. I believe that for some time the sector has been at best complacent about the issue and at worst in denial. Now there is clear evidence that discrimination exists, which is both structural and personal. How else do you explain the shameful lack of BME leaders in our sector? The issues are directly linked, as the editor of Inside Housing said in a recent editorial. How do we begin to overcome it? There are no easy answers as discrimination exists throughout society. I no longer believe that we can change people’s views, but we can change how they act in the workplace. We must openly accept that there is an issue and that discrimination exists in our organisations. For far too long we have been afraid to meet this head on. We have used phrases like subconscious bias as a camouflage for deeper issues. At a recent diversity conference, I challenged the audience to define where subconscious bias ends and racism and sexism begins? We must ask all of our leaders to sign up to eradicate discrimination in all of its forms and to report fully and openly on it. I have always believed that the involvement of an independent body to enforce this is required. In my view, the only time the housing sector took the issue seriously and made real progress was when the regulator and the audit commission was involved. 1. We must make it clear in all of our organisations that we have an inclusive culture and that anyone who acts in a way contrary to these values will be disciplined or dismissed. I believe that organisations should have a zero tolerance approach with policies in place to enforce this. 2. Netflix recently dismissed its chief communications officer after reports that he had used a racially offensive word. We should have similar policies in place and enforce them. 3. We should introduce independent and anonymous whistleblowing policies. Independent because research has shown that in many organisations people are uneasy about using internal structures for fear of reprisal and because perpetrators are often line managers or senior staff. People have to trust whistleblowing procedures. They will only do this if they are seen to be effective and appropriate action is taken. 4. We should ask our boards to hold the chief executive to account for successfully delivering a truly inclusive and non-discriminatory environment. This should be a major priority and part of performance regular reviews at all levels in our organisations. 5. Training and development will continue to have a role to play. But we have had many internal and external training programmes in my career. Action is required to back up training and development. These actions are not new, we first began talking about them 40 years ago. The sector has ignored the issue for too long. This report should be a wake-up call for real action. Just because we claim to have a social purpose and strong values, it does not make us immune to an evil that effects all society and is growing in our post-Brexit world. Unless we take strong action now, discrimination in housing will be exist in another 40 years. Is that the legacy those who work in housing today want to leave to the next generation? This article originally appeared in Inside Housing.